Mount Pope is a day-use park popular with hikers and rockclimbers. 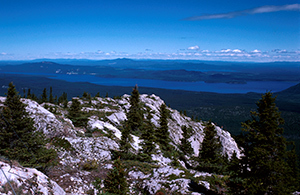 A 6.5 km hiking trail to the peak provides a panoramic view of Stuart Lake and the mountains to the north. Thirty-nine climbing routes have been documented. Natural values of Mount Pope park include rare plants and animal species associated with limestone rock formations and caves, as well as valuable winter range for mule deer. Hikers should carry a supply of drinking water as there is no potable water available on the hiking trail. There are no facilities available in this park. Overnight camping is prohibited in this park. There are climbing opportunites in this park. It is recommended that rockclimbers familiarize themselves with their intended climbing routes, the potential hazards associated with the climb, and any safety precautions required prior to setting out. One source of information about the climbs at Mt. Pope is the “Central BC Rockclimbers Guide to Central BC,” (Lyle Knight 1996). Mountain biking is permitted only on the trail. Bicycle helmets are mandatory in British Columbia. A 6.5 km hiking trail to the peak provides a panoramic view of Stuart Lake and the mountains to the north. The elevation gain is about 790 metres (2400 feet); allow 4 to 6 hours for the return hike. Hikers should carry a supply of drinking water as there is no potable water available on the trail. A gazebo is available at the peak of Mount Pope. This is an ideal spot to have a snack and enjoy the 360 degree view. There is a Gazebo at the top of the mountain offering a 360 degree view. Natural values of Mount Pope park include rare plants and animal species associated with limestone rock formations and caves; it is also a valuable winter range for mule deer. There are cross-country skiing and snowshoeing opportunities in this park, but there are no set tracks. The trails are the same as the summer trails.